So, this place has gotten rather dusty lately. Mostly I just feel that the world doesn’t have a huge need for my opinions on things. Like writing. It’s only been lately that we’ve been able to invest some time and effort (and some money) into it. Or maybe it’s only been lately that we’ve stopped feeling like overwhelmed dumb asses in a money pit and started turning what we have into what we want. Just so you have a clear idea, our little “homestead” is only .446 acres, a very urban double lot. What we’ve done is very, very doable and easy for even complete homeowner and repair newbies like us to do. So here’s the little homestead. I collected copious amounts of cardboard boxes and laid out double layer to smother the grass. On the far side of the grapes I have two compost bins (these, which are pretty awesome, nice and big, tough, but don’t allow you to turn the compost so composting takes longer). 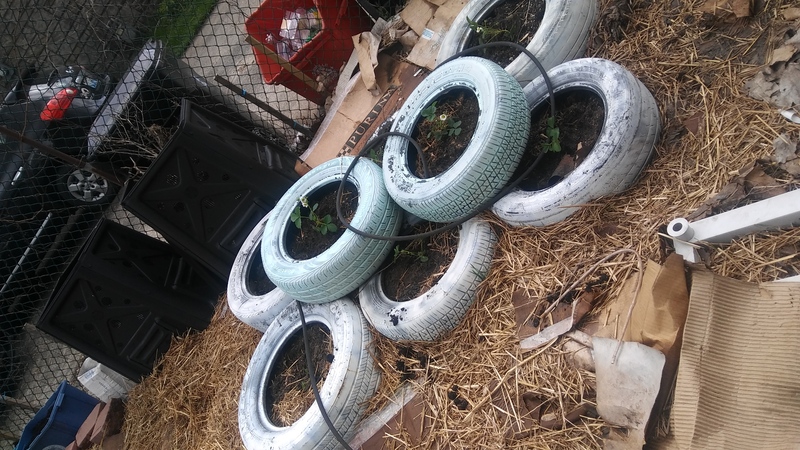 Then I spray painted 8 tires (which were easy to find on corners, junk piles and in alleys all over. Tip: make sure the tires do NOT have any of the steel bared because then you might cut yourself when moving them around.) 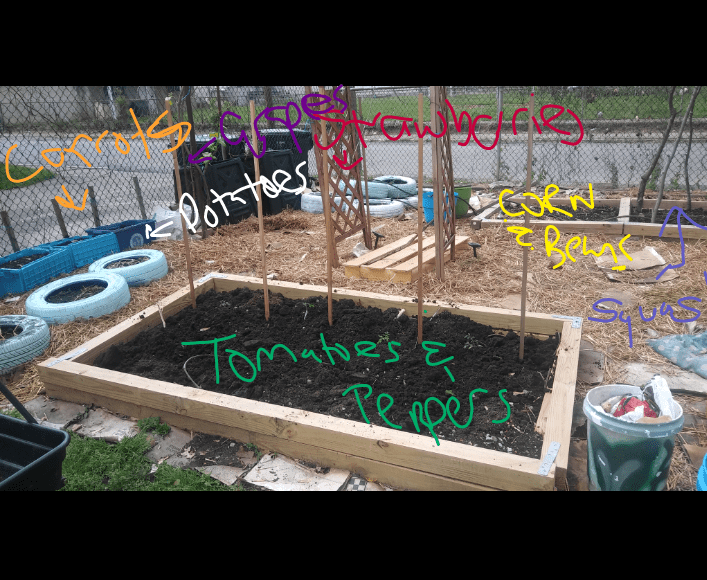 Those I stacked into what I loosely refer to as a “pyramid” and filled with soil. 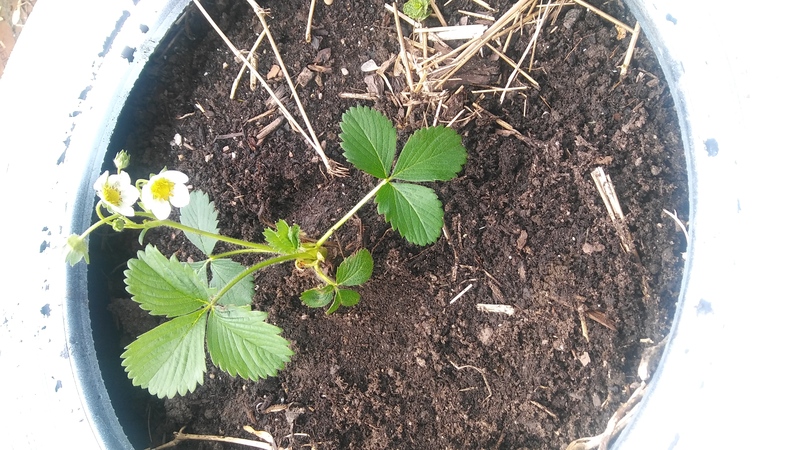 I planted strawberries in them. Next are two 18 inch planters from Walmart. I can move these (and any of the other containers) around as needed to get more space, less sun, etc. This year they have habaneros planted in them. 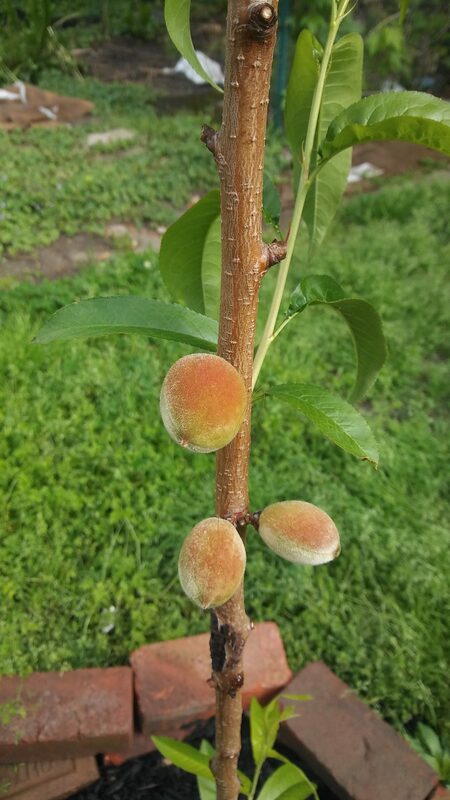 Habs, I’ve found, are well suited for pots because they stay smaller and so pots don’t restrict the fruit size or number of fruits. 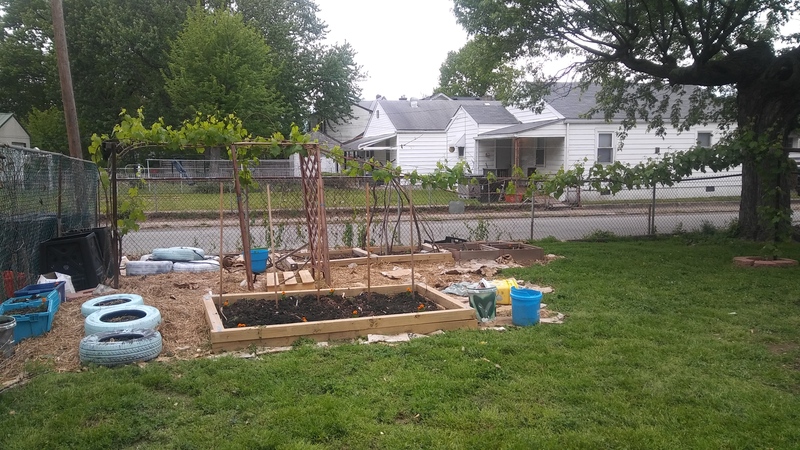 On the near side of the grapes I have 3 boxes lining the fence (where we discovered the dogs were getting out, but hah hah those boxes filled with soil are pretty heavy and they can’t move them anymore.) 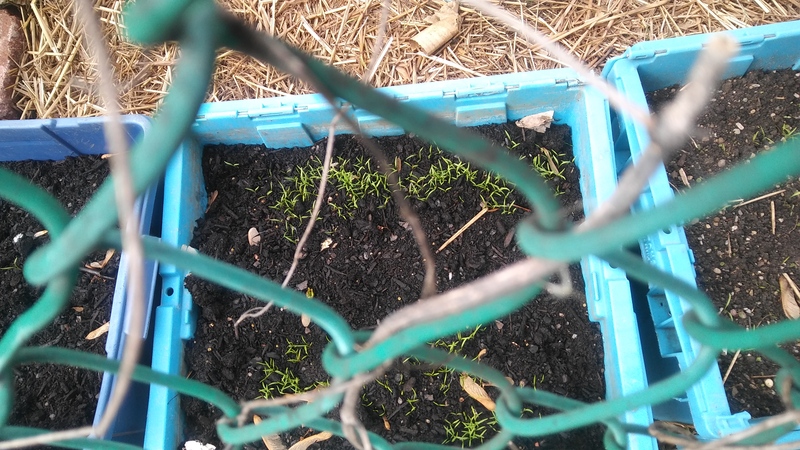 I planted them with carrots because carrots need very well controlled, not at all rocky soil so I prefer putting them in boxes. 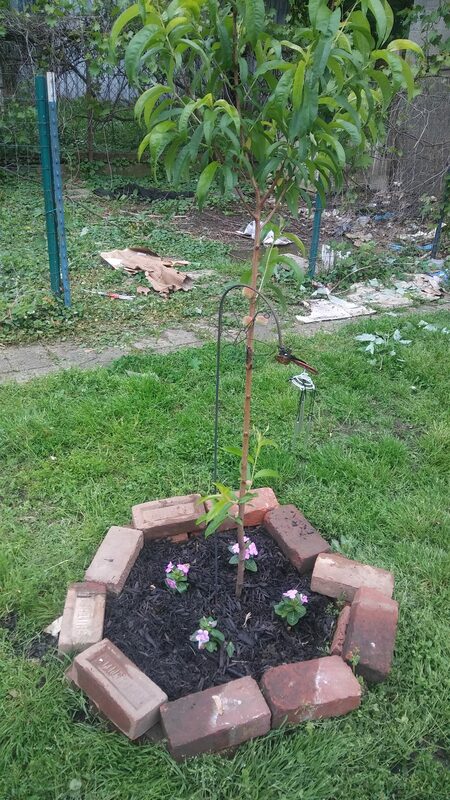 Then there’s a 5 gallon bucket on the end (that you can barely see) that I planted a cayenne pepper in. 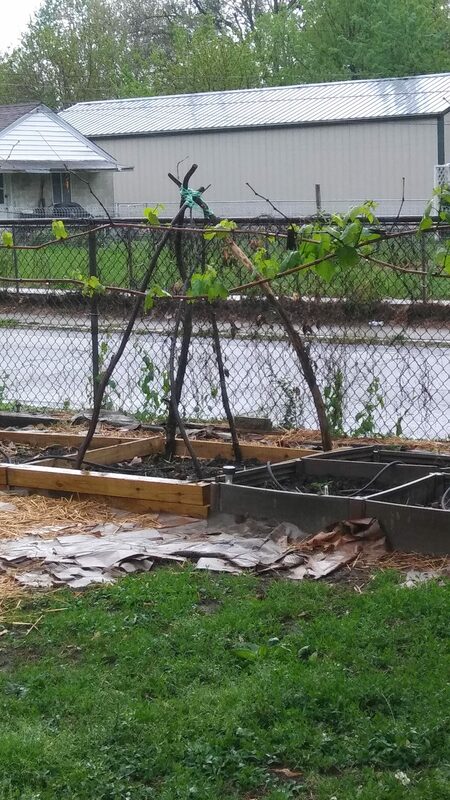 Next I put in another raised bed, this one is 8 ft x 4 ft (I’ve left lots of space for walkways and for those grapes.) This year it’s all tomatoes and peppers. Hopefully I’ll also be able to expand this with at least one more 8 x 4 bed, hopefully two.Then I laid a second layer of cardboard in the walkways and straw on top of it. Ta-da! And then there is the herb wall. But that I will get to in another post. Altogether not a bad spread or variety for a little, very urban, homestead.